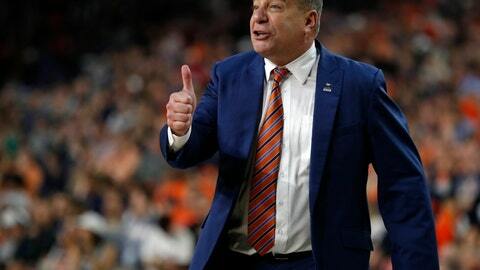 AUBURN, Ala. (AP) — Auburn and basketball coach Bruce Pearl have agreed to a new five-year contract. The deal announced Friday, which is worth about $20 million, runs through the 2023-24 season. Auburn spokesman Kirk Sampson says Pearl will be paid $3.8 million next season with a $125,000 increase in salary annually. The deal includes an $8 million buyout clause that begins next year and decreases by $2 million each year after that. Pearl led the Tigers to their first Final Four and a Southeastern Conference Tournament title last season, turning around a program that went 15 years without making the NCAA Tournament. Auburn also won a share of the SEC regular season title in 2017-18. Things haven’t gone as smoothly off the court. Pearl was hired near the end of a show cause penalty after running afoul of the NCAA at Tennessee. Assistant coach Ira Bowman was indefinitely suspended before the SEC Tournament for alleged involvement in a bribery scheme while at Penn. Auburn fired another top assistant Chuck Person last year after his arrest as part of a federal probe into corruption in college basketball.